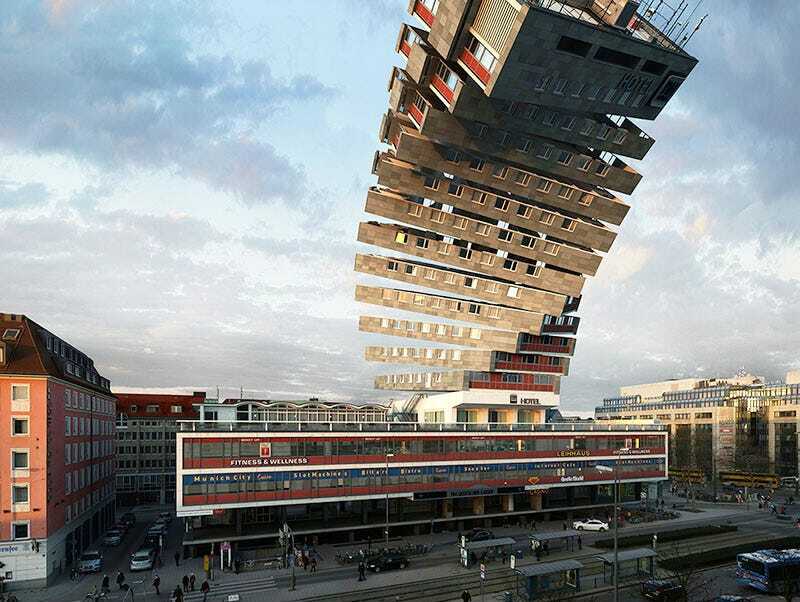 This is a real building; you're looking at an actual hotel in Munich, made much, much more interesting by Víctor Enrich. The site is the latest addition to the photographer's portfolio of mind-bending architectural distortions; here, he's transformed the same building 88 times, each more WTF than the last. The most amazing thing is that they all look... believable. They obviously aren't feasible as brick-and-mortar constructions, but somehow he manages to make it seem like they could be. Enrich imagines sides we'd never have the chance to see—like, say, the bottom—gives glimpses of angles that would never be built, crafts impossible bends and unbelievable splits. All that, plus gravity defying floating orbs? C'mon! These are great, and would make for a fantastic backdrop for a movie set in a trippy alternate universe. What if the buildings that lined the streets you walk down every day could morph on a moment's notice?